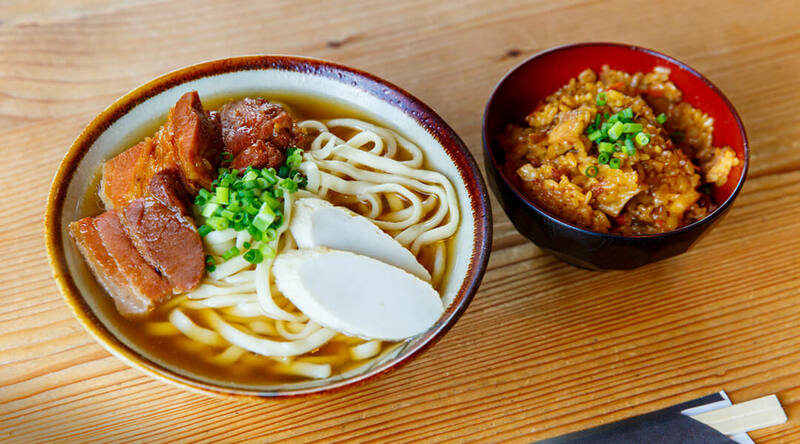 Nuchigusui things to do in Okinawa: Wholesome Food | Live Nuchigusui. Good news for those who like to eat: Okinawa is gourmet heaven and offers a unique dining experience unlike anywhere else in Japan. Okinawa’s food is both delicious and extremely healthy, as the islands are known for having many long-living residents. The local lifestyle and the highly nutritious food available in the area are thought to be keys to this longevity. Food is also the origin of the Okinawan saying ‘nuchigusui’, which means ‘life’s medicine’: a concept that describes how someone who eats a meal receives vitality from the person who made it, resulting in a healthier and happier body. For many Okinawans, eating means taking care of your mind, body and soul through healthy living and, most importantly, eating. Join the cooking experience at Taste of Okinawa, an English-friendly cooking studio located in the heart of Naha, where you can learn how to cook up a tasty Okinawan-style meal using fresh, local ingredients. The program includes a tour of Naha’s public market, where you can learn about local produce, followed by a cooking class focused on a particular Okinawan dish. 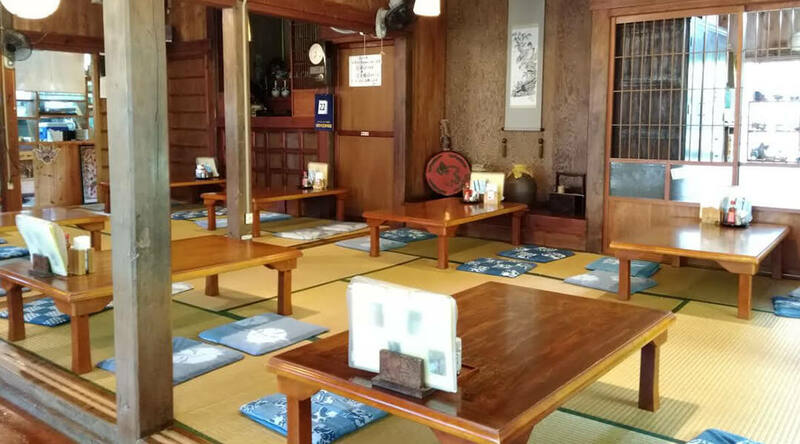 Another way to experience nuchigusui is by visiting small, local restaurants run by an ‘obachan’ who can cook up a tasty spread of Okinawan cuisine with local produce. You’ll be able to try specialities like rafute (braised pork belly), jimami tofu, Japanese bitter melon, umibudo sea grapes and mozuku seaweed in a soy and vinegar sauce, as well as other seasonal dishes depending on the time of year. If you want to try Okinawa’s traditional longevity-boosting diet, head on down to a restaurant where they’ll serve you with a smile. 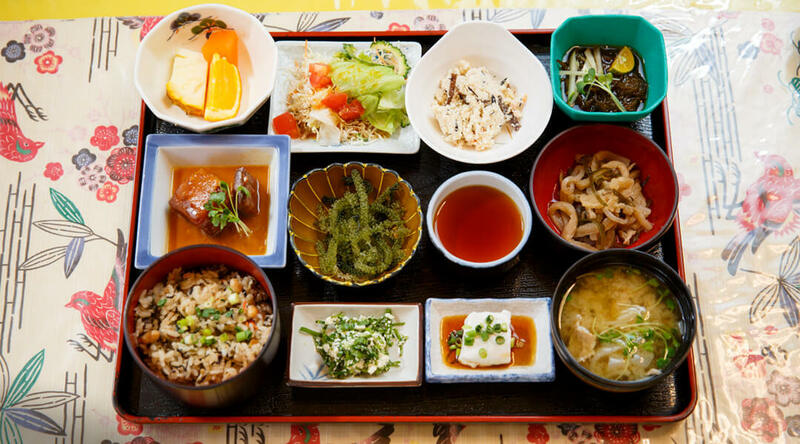 Okinawan cuisine includes plenty of distinctive island vegetables to nourish your body and soul and keep you contently fed. Since the times of the Ryukyu Kingdom, Okinawa has come to have its own unique food culture with an abundant diversity of culinary traditions. 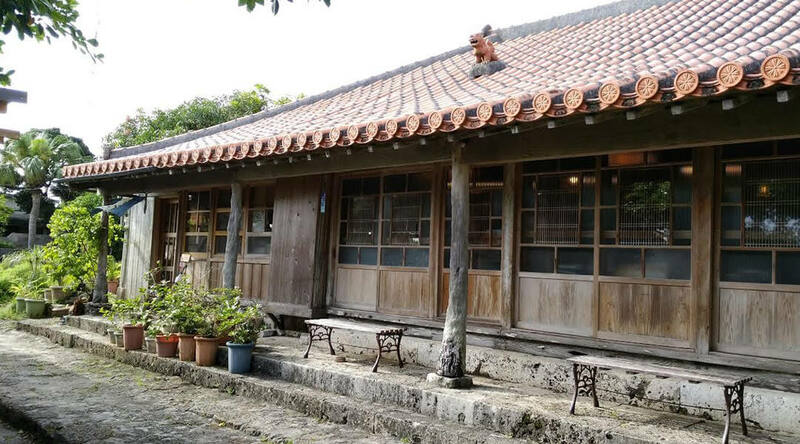 If you’re looking to taste the flavours of Okinawan home cooking, look no further than Makabe China, housed in an old refurbished tea house where herbs grow in the garden and the residence is shaded by a great Okinawan banyan tree. Sit back, relax and savour tea made from freshly picked garden herbs, or go for traditional Okinawan favourites like goya chanpuru and Okinawan soba. Kokusai-dori (aka International Street) is also home to numerous restaurants. Locals often finish a night on the town with a delicious protein-packed meal at late-night restaurants like Jack’s Steak House, which has been running for over 60 years. It’s as popular as ever, so you’ll see lines of customers waiting to tuck into a juicy steak. There’s a lot of delicious food to try in Okinawa, but the café scene is just as exciting to explore. Sip on traditional buku buku cha, one of Okinawa’s traditional tea drinks that was served to royals back in the day. It’s a unique drink known for its foamy topping, made from whisked white rice and sitting on top of warm genmai tea. These days you can find buku buku cha offered with a modern-day twist, as the foam topping is sometimes flavoured with a hint of ‘sanpin’ (jasmine tea) and can also be found sprinkled with peanuts. 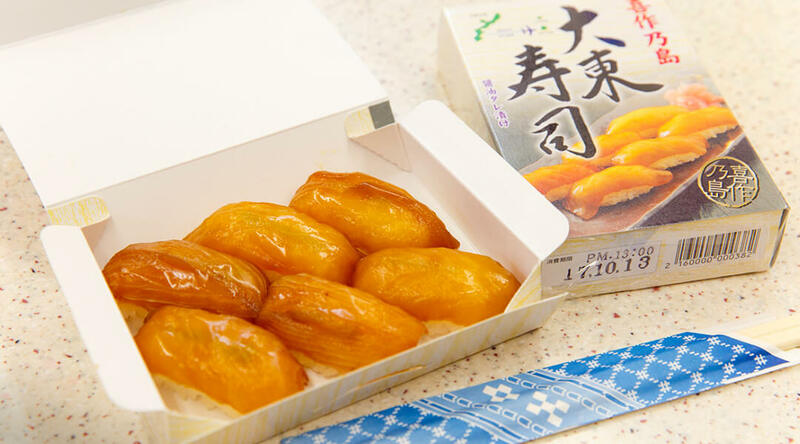 Another Okinawan café speciality is a sweet bean dessert called zenzai. 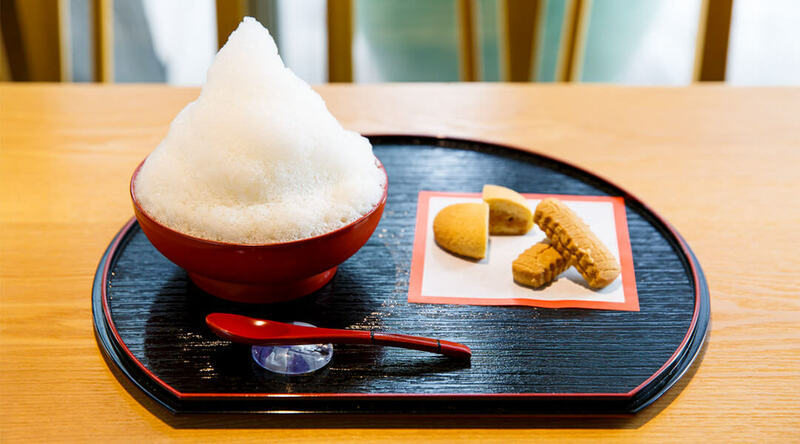 Although this dessert usually comes in a soup-like form, the kakigori zenzai served at the local shop Inamine is something truly unique. 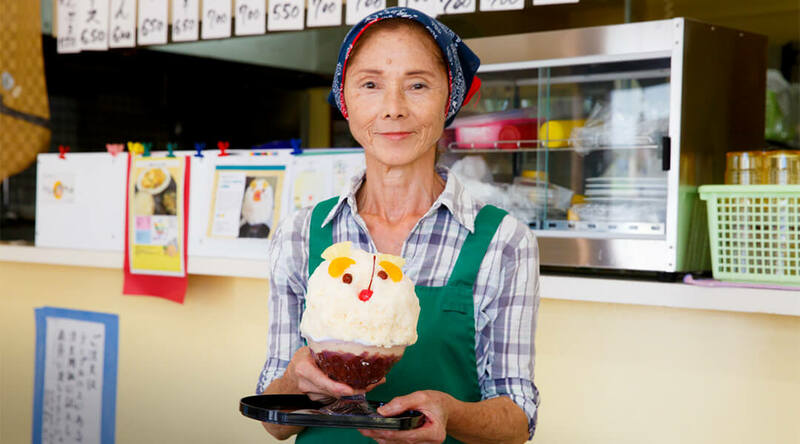 Here you’ll find a sweet mix of kintoki beans and chewy mochi topped off with a mountain of fluffy shaved ice and drizzled in a sweet milk topping – a concoction ideal for cooling you off during the warmer months. Inamine. 1486-3 Itoman, Itoman-shi, Okinawa. Okinawa soba could easily be called the soul food of the Okinawan people. This particular type of soba is different from what you might think, as it’s characterised by a rich soup stock using ingredients like pork and bonito, along with plump Chinese-style noodles and the added flavour of red island peppers pickled in Okinawan liquor and ginger. The town of Motobu, which is best known for the Okinawa Churaumi Aquarium, is also home to a district called ‘Motobu Soba Main Road’. This concentration of more than 20 well-known Okinawa soba shops is said to be here because Motobu is mainly a port town where bonito fish is readily available. One shop you should take note to visit is Kishimoto Shokudou, which specialises in a deep-flavoured broth and is known for its homemade noodles that use the froth from boiled tree charcoal. Another recommended shop is Yaezen, found in the vicinity of Motobu Soba Main Road. Kishimoto Shokudou. 5 Toguchi, Motobu-cho, Kunigami -gun, Okinawa. Yaezen. 342-1 Namizato, Motobu-cho, Kunigami -gun, Okinawa. With different lands come different fish. 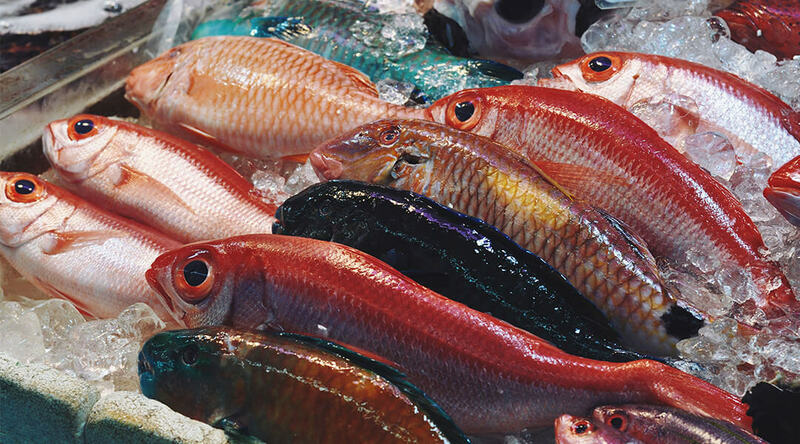 At an Okinawan market you'll find plenty of colourful tropical fish, including knobsnout parrotfish, bluestreak emperor and queen snapper. Okinawa is probably one of the only places where you’ll be able to enjoy such unusual sushi, made with tropical fish and unique Okinawan ingredients. For instance, at the major conveyor-belt sushi restaurant Gourmet Kaiten Sushi Ichiba you can taste ‘umibudo’ (sea grape) gunkan and tropical fish nigiri at reasonable prices. Another one of Okinawa's most popular sushi spots is Daito Sushi, known for its use of sawara (Japanese Spanish mackerel) pickled in a sweet marinade made from soy sauce. For those on the go, Daito Sushi bentos can also be picked up at Naha Airport, allowing you to end your trip with a tasty meal on your flight home. © Okinawa Prefectural Government. All Rights Reserved.